If I’m honest, my performance on Tuesday’s club time trial was a bit ropey. First time back on the bike after being ill, everything felt hard work. My legs went up and down ok, but my HR was high and the power ouput some 15w lower than it should have been. I was more than a little worried that 2 weeks off had done more damage than I reliased. That was two days ago. 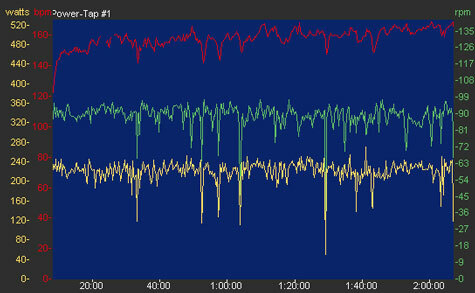 Tonight, in total contrast I turned the cranks for over 2 hours at a strong tempo pace and felt great. The cobwebs well and truely blown away as 62km blustery and undulating kilometers were dispatched in just under 2 hours.